Making life better with a little bling is known in the fashion world as standard operating procedure. But did you know your home can have the same effect by adding little touches that can provide impact? After all, fashion and interior design are symbiotic arts. One has to realize that the eye is attracted to light not darkness. 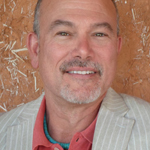 Placing high chroma in an environment reflects more light and draws attention. The same thought works for enhancing your light fixtures. It seems an obvious choice that lighting will be the most dominant attraction in a room. But the actual light effect in the fixture can be enhanced with a few tricks of the trade. Tradition has always placed crystal or reflective items around light sources. When all interior lighting was with candles, adding faceted prisms or placing the candle in front of a mirror amplified the lighting of the candle flame. This design process took hold and chandeliers, sconces and light stands all adopted crystals to reflect as much light as possible, even in the electrified age. This custom is now a design element, one that I work with on a day to day basis. Putting a light source inside or beside a reflective or prismatic item magnifies the quality of the light and applies different properties to the light effect. Faceted crystal pendants will split the light into the light spectrum and fill your interior with the myriad colors of the rainbow. This can produce some amazing design possibilities for those of us in the lighting industry. With an array of crystal products on the market today, I can design for traditional lighting environments using faceted pendalogues, crystal spikes and rock crystal. Contemporary lighting is also using “bling” lighting elements to warm up an otherwise sterile environment. The juxtaposition of traditional elements in the modern environment adds a touch of whimsy. It also ensures that the lighting element be perceived as a design element and not just a source for brightening the room. 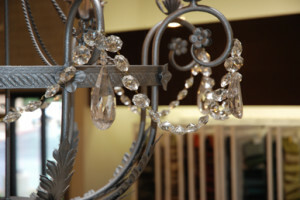 Adding crystals to a fixture can be simple. Attaching a cut glass element with pinnings to an existing fixture is an easy fix. But designing a fixture that will have the light source and the crystal element work to together to provide the most dazzle is an art if not a science. 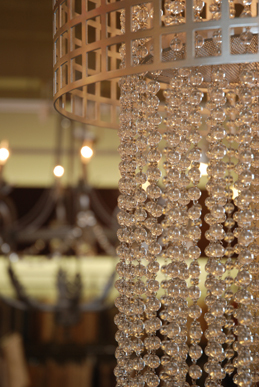 Developing a fixture to hold as many as 300 teardrop crystals for a contemporary dining chandelier requires enough structural integrity to keep the entire chandelier from crashing down on the dinner party. Weight is an issue and needs to be considered in the actual structural support that mounts the fixture. 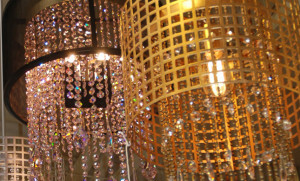 It is not unprecedented for structural enhancement to occur in a home or office to accommodate the weight of the lighting fixture when hung with oodles of crystal. Crystal has an almost palpable effect on the senses. It can resemble diamonds and will elicit the same response in the viewer. There is something magical about light in the matrix of glass that mesmerizes and transfixes the onlooker. Captivated by the colors, one never tires at looking as a Strass crystal chandelier. Since glass is unique in that it can be colored and it will not fade, the array of possibilities for the actual fixture to compliment a color scheme in a room makes crystal lighting unique in the design world. Through time immemorial the effects of light still make us wonder. Cleopatra realized these possibilities and had triangles of light projected with candles and mirrors onto the wall of her bedchamber. She was able to conquer Rome. The same dazzling effect can help you conquer your world from the confines of your bedchamber with just a little bling.